State Department of Natural Resources’ Atchafalaya Basin Program (ABP) and Iberville Parish officials announced today the start of construction for improvements to the boat launch at Bayou Sorrel located in the heart of the Atchafalaya Basin. 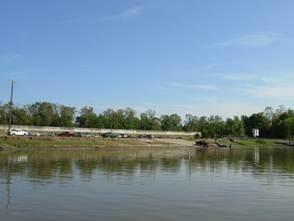 The total construction cost of the project is $683,000, of which the department contributed $670,000 from the FY 2011 Atchafalaya Basin Annual Plan. The remaining portion of the construction costs and all engineering costs are being funded by Iberville Parish government. The project consists of a launch ramp on the north end, ADA accessible parking area, and a walkway going out to the relocated floating pier. The parish will provide maintenance and upkeep of the facility. DNR Secretary Stephen Chustz said state and parish officials have worked together for some time on the planning of this project striving to improve citizen accessibility to this popular area of the Atchafalaya River basin. “So many recreational fishermen consider this area of the basin a prime fishing spot and this will improve their ability to utilize the area,” Chustz said. Iberville Parish President Mitchell Ourso, Jr. said the contractor at the site, Cajun Maritime, LLC, has begun laying down the groundwork for the long anticipated improvements for the people of our parish, and many visitors to come and enjoy. “It won’t be long now that this community-led project becomes a reality. The parish also plans another construction phase with new features for boaters, fishermen, and families alike to utilize, including new restrooms, a south end ramp, and security lighting,” Ourso noted. He said the project is expected to be built within five months and was designed by the SJB Group, LLC of Baton Rouge.